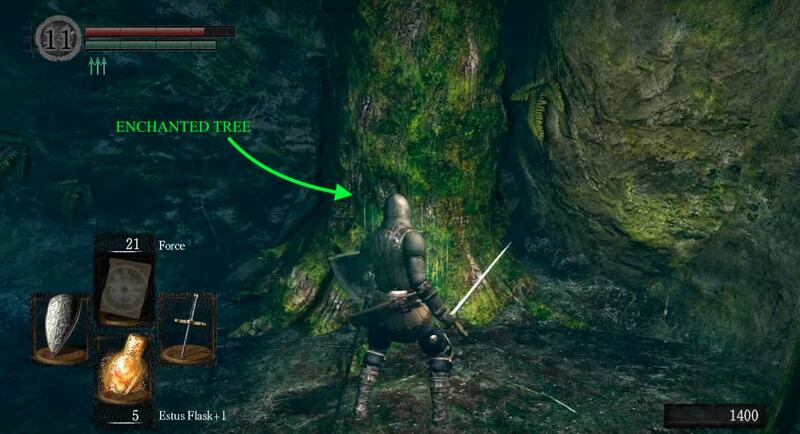 Darkroot Garden is an area in Dark Souls and Dark Souls Remastered. Usually accessed early in the game by heading downstairs from Blacksmith Andre in the Undead Parish. It is also possible to enter from Darkroot Basin, but this requires heading through very dangerous territory for a low-level character. 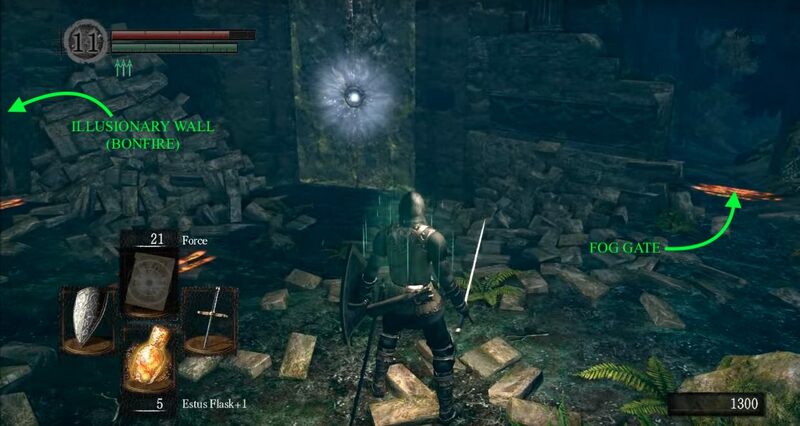 Darkroot Garden is accessible early in the game, through the room containing the Titanite Demon below Blacksmith Andre. 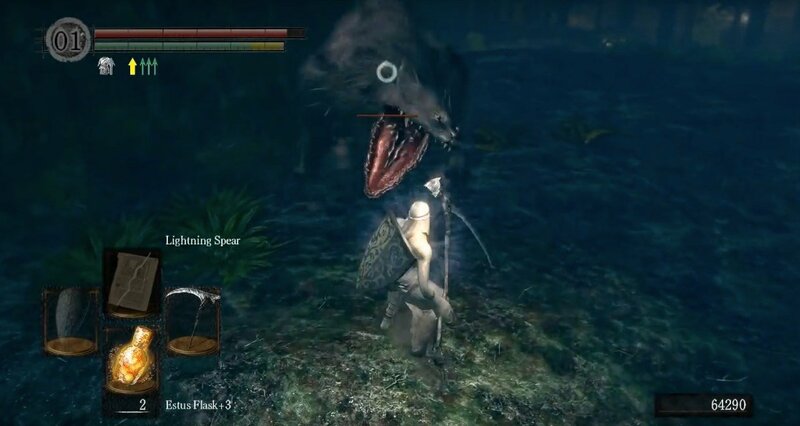 (Note: it is not necessary to beat the Titanite Demon - just run past it if you want). In here you'll find an essential ring for continuing the main quest. NOTE: If you have access to the Aota DLC and wish to get the alternate cutscene for the Sif boss fight, be sure to complete the dlc before triggering the boss by opening the gate at the end of this area. Keep in mind that doing events in this order will prevent you from joining the Darkwraith covenant until the next NG cycle. 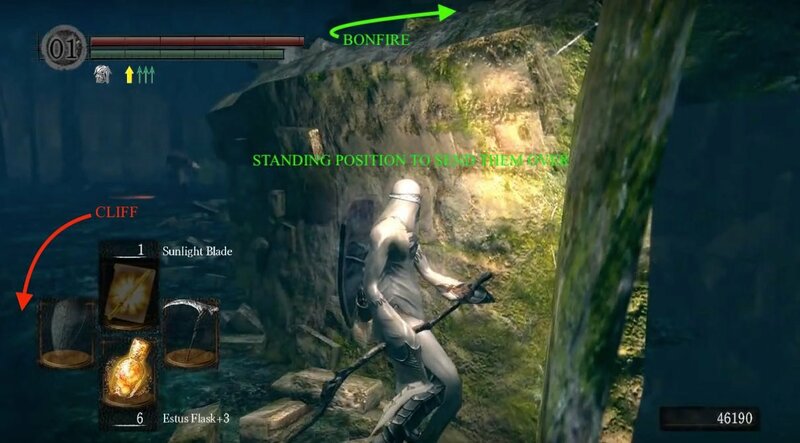 Get To The Bonfire - Upon leaving Blacksmith Andre and the Titanite Demon, follow the path to your left. Along the way, take the path leading right; you'll find a path leading down a cliff toward Darkroot Basin, but ignore it for now and continue straight down the initial path. As you go, you'll notice an item on a ledge to the left that you can't reach (yet), as well as a Soul of a Nameless Solider that you can reach on a corpse behind a rock ahead. You'll also encounter 3 or 4 Ents as you go along; Ents are animated tree enemies and have some surprisingly long range melee attacks but won't pose a threat if you keep your guard up and take them on one at a time. Keep your distance to avoid their grab attack as you cannot guard against this attack, and it can do a fair amount of damage. Continue on until you see some stone walls, a pile of rubble and a stone door with a glowing lock. On the left of the pile of rubble is an illusory wall that will disappear if you attack it, revealing a bonfire. If you're having trouble finding illusionary walls, most important ones are easily identifiable as they have an Orange Guidance Soapstone that give them away. Ambush - Leave the bonfire, and head down the path that leads down to a fog gate. Just before reaching it, you may notice an item in the middle of an area to the right - it's a trap, of course. There are three burrowed Ents that emerge as soon as you grab the item, however you can pick them off one at a time, by attacking their bushes first. Once you've dealt with your ambushers, and picked the Large Soul of a Nameless Solider, head through the fog gate. - Through the gate leads to an open area where you'll encounter 5 sleeping Great Stone Knights, some more burrowed Ents, two Tree Lizards and some treasure in the distance - but you can ignore all of them for the moment. Take a right after going though the fog gate and you'll find an Enchanted Tree blocking the way to a small passage - hack away at the tree until it disappears. Travel down the passage, killing the Frog-Ray - a fairly weak, new enemy, only found in Darkroot Garden - along the way, until you find another open area behind another Enchanted Tree. Poise Ring - Hug the wall on your right, and continue until you come to find a passage with stairs leading upwards. Follow the path to the end where you will encounter your first Great Stone Knight before reaching the item you saw on a ledge earlier - the Wolf Ring. These enemies can be bested easily enough if fighting them 1-on-1. A good chunk of their health can be eroded while they are getting up off the ground and careful use of blocking and strafing behind them to attack is the best strategy for fighting them. You can avoid getting involved with some of the Great Stone Knights in larger areas entirely by simply giving them a wide berth - they won't wake up unless you approach them - but some of them are unavoidable. Return to the bottom of the stairs and into the open area once again. Continue in the same direction you were headed, before you climbed the stairs. You'll eventually come across the water at the end, of which three Frog-Rays will jump out of. Dispose of them, then proceed to take a left at the end of the area to find one more Frog-Ray and a corpse with a Soul of a Proud Knight on it. 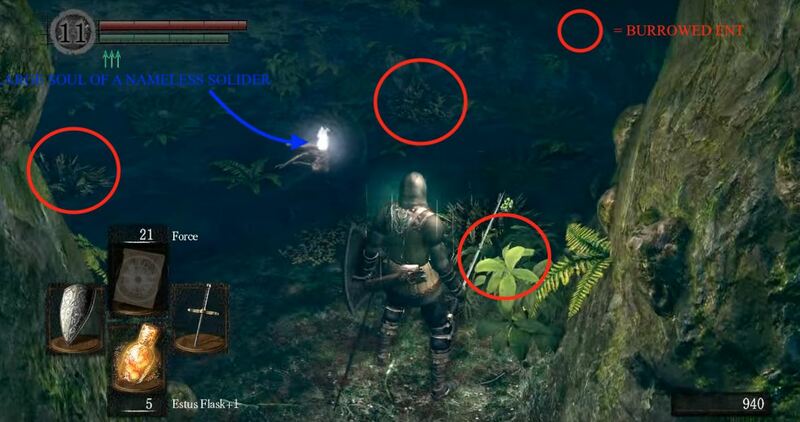 Now, there may be another Great Stone Knight laying about in this area - given he hasn't attacked you on your way back down the stairs from retrieving the Wolf Ring - you may find and kill him, or backtrack through the passage you came through, to where you found the fog gate and turn around so your facing the open area. Almost There - As stated earlier, this area has many enemies but most can be avoided if you wish. From the fog gate, hug the left wall until you see a small passage to the left. Proceed in to find the Partizan and a Tree Lizard on the side of a tree. Head back out of the passage and continue hugging the left wall as you cross the open area and you will eventually make your way around, behind some rubble & straight to a doorway blocked by a sleeping Great Stone Knight. After dispatching of him, you can then enter the doorway into the tower. If you are in human form, roll through the bushes under the stairs to find a summon sign for Witch Beatrice. Her spells will be a great help during the following boss fight, especially if you are not a casting based class. Follow the stairs all the way up to the fog gate, and get ready to fight the first of this area's two bosses. Claiming Victory - Once the boss is defeated, climb the tower on the far side of the walkway to acquire the Watchtower Basement Key and Divine Ember at the top. Bringing this to Andre will allow you to forge divine weapons - which are extremely useful for dealing with the Skeletons in The Catacombs. Becoming Elite - Go all the way back down to the open area and hug the left wall to get to the treasure we ignored earlier. The Elite Knight armor set is the loot on the corpse, however, the 2 sleeping Great Stone Knights and 4 burrowed Ents will attack you as soon as you pick it up; either brave them or bolt it. Once you've collected the treasure here there's nothing left to do but go back to the bonfire. 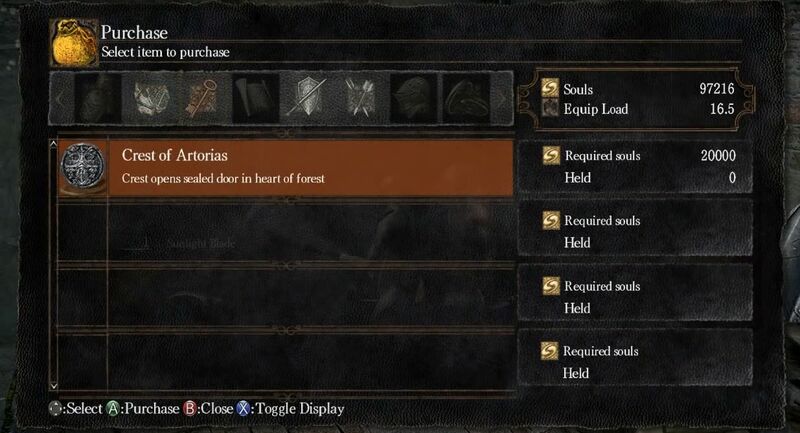 Entrance To The Forest Hunter's Woods - If you have collected 20,000 souls on your journey through the garden so far then you can buy the Crest of Artorias from Blacksmith Andre; killing Andre will also give you the crest, but this is not advised if you want to upgrade your weapons. This item is used to open the glowing lock next to the bonfire. 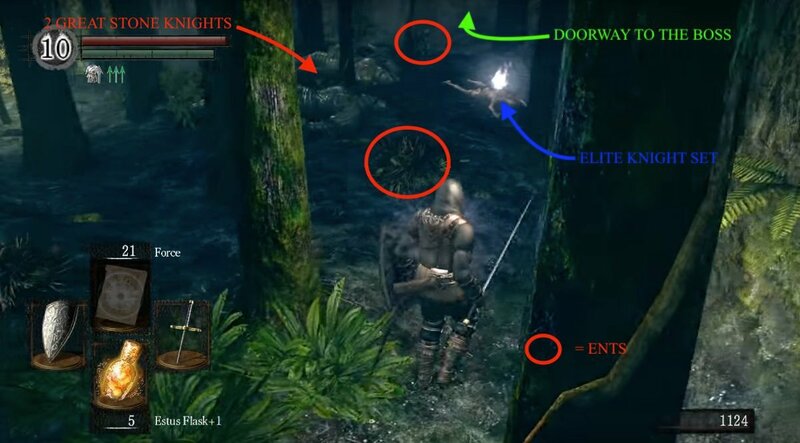 Once open, it will lead to a wooded area that can only otherwise be accessed from Darkroot Basin, thus proving to be a reliable shortcut (Note: The door cannot be opened from the inside and thus you'll need to obtain the Crest of Artorias to open the shortcut). Run out into the woods and once you have attracted the attention of a few enemies, go back to the stairs from where you came in. Before going up, you will notice there is a ledge you can go to on the right of the stairs. If you go to the end of that ledge you can wait there and the enemies will not follow you. Instead they will go up the stairs to try to attack you, but will usually fall off the stairs, over your head and off the cliff to their death while attacking. Once your pursuers have all fallen to their death you can now more easily explore the area, but warned that there may be more human enemies ahead. Be The Stone - If you encounter more of them you can try taking them on in a straight battle or simply follow the trick above again. However, there is one that will not follow you - Pharis; we'll meet him soon. Traverse the area along the left side and you'll reach a structure with a bridge behind it. Very briefly, go across the bridge out the back of the structure and continue down the stairs until you've reached the outside. From there head left and follow the wall to find with a chest around the back, containing the Stone Knight Set. Good Kitty - There's no need to go into these woods for the moment, so go back across the bridge and inside the structure again where you can talk to the white cat, Alvina, to join the Forest Hunter Covenant. If you don't want to join then fair enough, but these are some key things to know about joining this covenant. After joining, the human enemies that once attacked you on sight in the woods will now be peaceful unless you choose to attack them - in which case the covenant will be broken. Alternatively, clear out the forest, including Pharis, before joining the covenant. This way you can benefit from all the souls, and possible item drops, and not have to worry about betrayal. Before you fight the ninja bodyguard, it would be a good idea to talk to Shiva until you exhaust his dialogue. 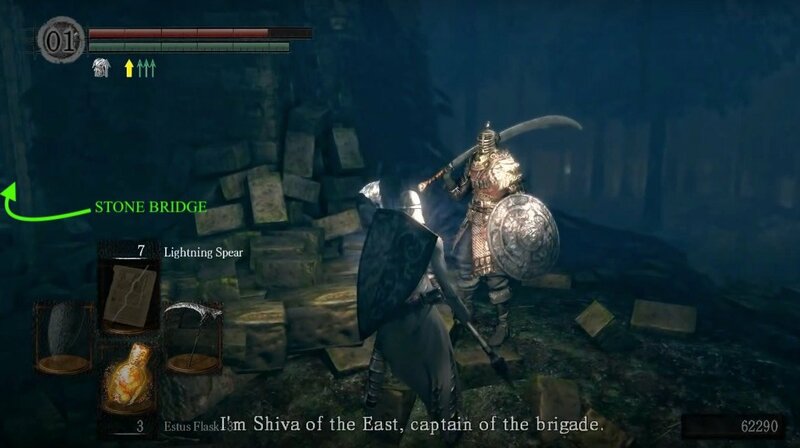 By doing so, Shiva will sell you rare and valuable weapons underneath the waterwheel elevator in Blighttown, but only if you are still a member of the Forest Hunter Covenant. It is recommended to buy all of Shiva's items before fighting the ninja for the Dark Wood Grain Ring. If you enter the Forest Hunter's Woods in human form after betraying the covenant, there is a high possibility that you will be invaded by other online players that are part of the covenant and you will be locked in the area until either you or the invaders are defeated. Absolving your sins with Oswald of Carim will stop the invasions from occurring, but you will still be attacked by the NPCs in the woods until you re-join the covenant. Robin Hood - Still out the front of the structure, keep going around the area with the edge on your left side and you'll eventually find Pharis. He's quite nimble and can switch between a sword+shield combo and a bow quickly depending on your proximity to him. If you kill him you'll get the Black Bow of Pharis, Pharis' Hat, a humanity item and some souls. Continue, keeping to the left, and near your encounter with Pharis, you'll also encounter or drop down into a small passage leading left to a stone bridge - make a note of this area, we'll come back here in a moment. If you explore the rest of the wooded area past where you dropped into the passage you'll find there are many more Ents in this part of the forest and are tougher than the previous bunch you've dealt with so far, so be prepared. Keep following the area around and you'll come across a corpse containing the Eastern Set as you travel. Now go back to the passage leading to the stone bridge from earlier. Shortcut To The Basin - Before you cross the stone bridge, go down the ladder to the left of it and pick up the Soul of a Brave Warrior. Down here you can also access an alternative route to Darkroot Basin and the Hydra by carefully going around the man-made pillar to the right of the ladder, across a wooden bridge and down another very long ladder - though beware that this will place you right beside the Hydra and this isn't necessarily the best place to take it on. These cats have a rolling attack that travels great distances fast, so it is a good idea to stand near the trees where you came through, because they can't enter this wooded area and it becomes harder for them to hit you. A good strategy for defeating them is to wait near the trees and lure them over to you and then attack them while they're backing away. There will be three of these cats, so patience is important during this fight. Once they are defeated you can go through the small open field they were in freely. At the end on the right you'll find an item on a corpse and turn left to find yourself on the edge of another wooded area - the same wooded area found out the back of Alvina's structure. The Last Of The Loot - To your right you should see a strange bright light through the mist, but go left for now and will encounter some Mushroom People. The small ones here are peaceful until you attack them and if you do, they will run away only to come back later to do insignificant amounts of damage to you. If you venture a little more into the forest, you will encounter two Large Mushroom People guarding a chest in a pool of water - approach them in the pool and they, are not so passive. They have a slow but very powerful attack and can be defeated easily enough if you have some patience and attack them after they attack - but beware of their 2-hit combo. They drop Gold Pine Resin once defeated. 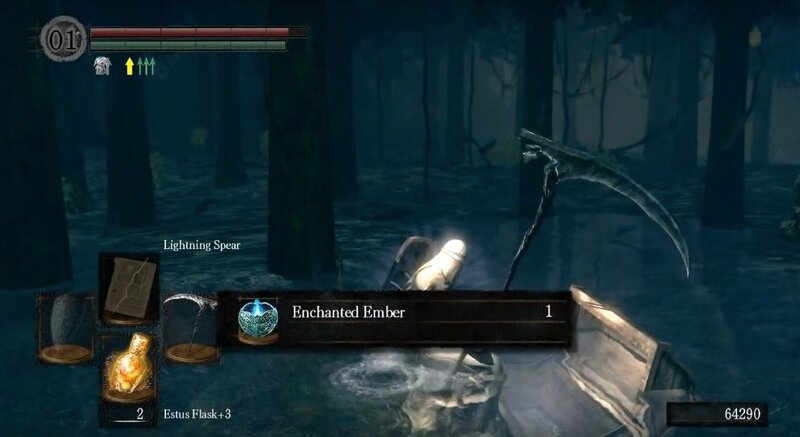 After you have defeated both of them, go back to the pool you found them in to open the chest and get the Enchanted Ember - this can be given to the Rickert of Vinheim in the New Londo Ruins to ascend your Magic weapons to Enchanted status. Big Doggo - Now go back the way you came, towards the bright light you saw earlier, and eventually find a path leading down to a bridge. As you cross the bridge you will see the bright light is emanating from a very large door. Open it to be granted access to a clearing with a big gravestone in the middle of the area. This is the final resting place of Artorias the Abysswalker who, legend has it, was buried here after his sacrifice to stop the spread of the Abyss in Oolacile and saving Princess Dusk. 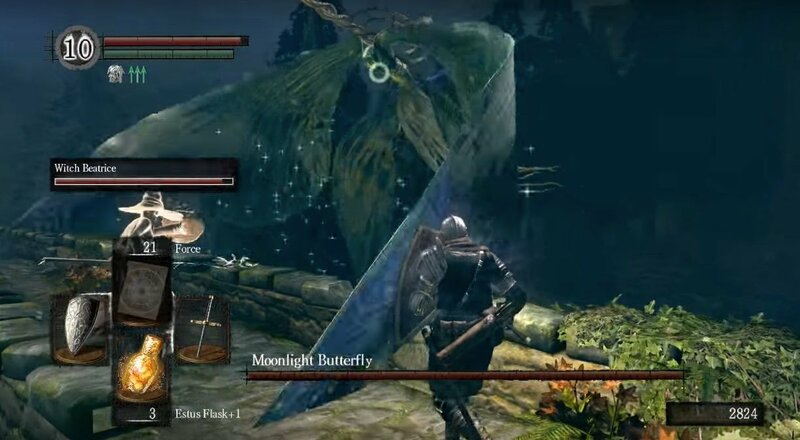 Approaching the large Greatsword in front of the tombstone will trigger the second of Darkroot Garden's bosses. Tip: It is a good idea to stock up on a few firebombs before the fight if you are not a mage or archer. 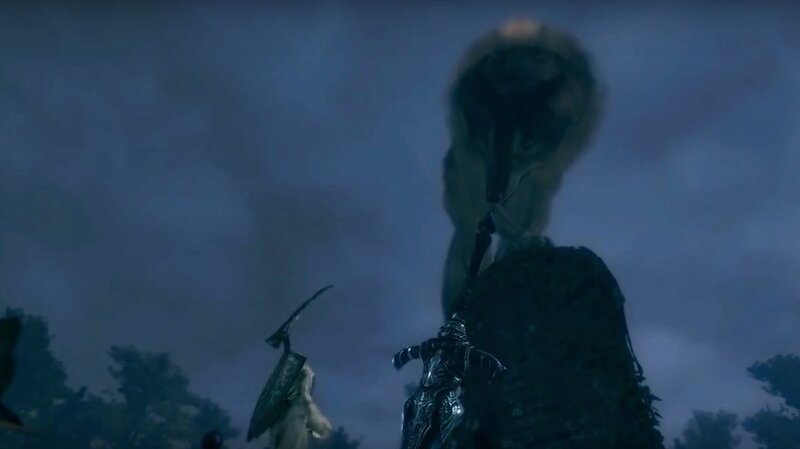 Once he has been defeated, he will drop his soul, the Covenant of Artorias, and will give you 30,000 souls. If you check behind the gravestone, you will find the Hornet Ring. Return to Firelink Shrine to continue your quest in New Londo Ruins or go down to Darkroot Basin for some more forest-based fun. Earn It - You will need a bow and arrows, and have opened the door with the Crest of Artorias (costs 20,000 souls, see above), save at the bonfire near the door. Make sure you're not in the Forest Hunter covenant because these guys are pretty lucrative kills. 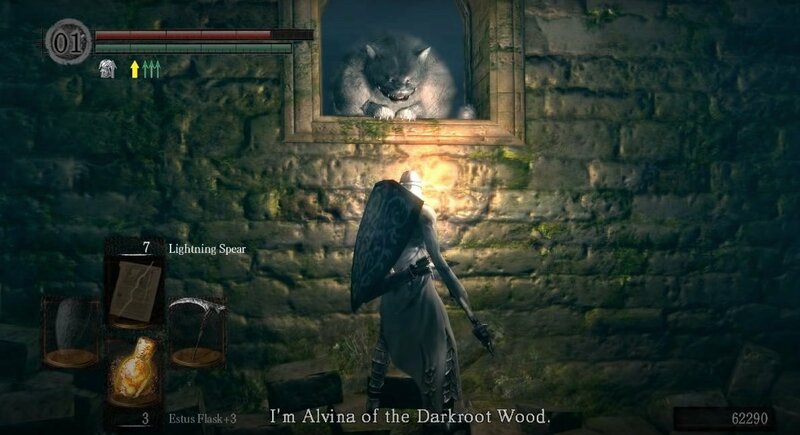 Go past the 'Artorias' door and down the stairs, head towards the forest in the direction to Alvina the Cat, and fire an arrow at the first enemy (the mage), make sure you take cover in the trees to avoid his soul arrow. Try to kill him without going deep into the forest (past the tree-line) or you'll lure an invisible thief. After killing the mage and scoring 2,000 souls, face the direction to Alvina and look a little to the right, there should be a cleric in the distance that you could pull with an arrow, just fire one and try not go far into the forest again. Finally, return to the bonfire and repeat. Each run earning you 4,000 souls if you kill the mage and cleric. Add another 2,000 if you manage to pull and kill the invisible thief. Cheese It - An easier way to farm here is to run in a large circle, getting the mage, invisible thief, cleric and warrior a little higher up (towards the cat) to follow you. Run back to the stairs that lead to the fire, and if you go to the right of the stairs, there is a ledge that you can easily walk onto. Go right into the farthest corner, as the enemies do not go that way. They will climb the stairs to try to get at you, and fall off the cliff while attacking you. Return to the bonfire and repeat. 7000 each time and you can get 100,000 in about 20 minutes. If any of them when falling do land on the edge you are on, just hold up your shield and they will knock themselves off the cliff trying to attack you. Once you are in the corner just be patient. They will usually come after you eventually. Partizan (spear - found in a side passage on the left side of the big area past the wall of white light. Just hug the left rock wall until you find an opening. Beware of the Tree Snakes lurking right above the spear). Enchanted Ember - Found in the pool guarded by the Large Mushroom Men. Elite Knight Armor Set - Found roughly in the middle of the clearing with the sleeping giants. Eastern Set - Found on the edge of the forest of Alvina, guarded by three Ents. Hornet Ring - This can be found behind the large stone near the sword you approach to begin the Sif encounter. Stone Knight Set - Across bridge from Alvina past some rubble in a chest. Best place to grind early levels. 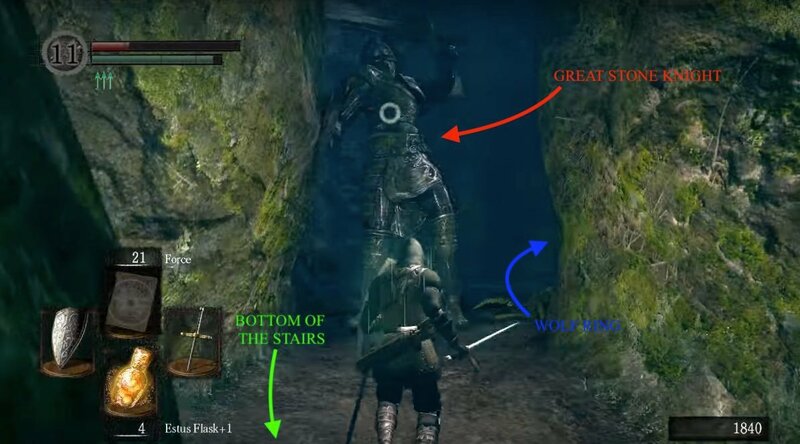 Wow is Ds1 anything else than backstabs and cliffs falling ? Seriously no enemies have killed me without resorting to backstab or being sucked down a cliff bc apparently 1m away isn&apos;t enough ? I&apos;m amazed this game got a sequel seeing how awefully it was put together. Not even mentioning how this game&apos;s area barely make sense the way they are placed. Anyways point was be careful tons of npc enemies here trying to backstab. Btw how tf can they get a backstab from a roll ? This make 0 sense. Ignore the note at the top of the page ("If you have access to the Aota DLC, be sure to complete that before heading into the fog gate of the boss at the end of this area") It sounds like you&apos;re about to do something game-breaking, when in fact the order you do these areas just makes a slight change to one cutscene. Changed some text color for consistency and readability.